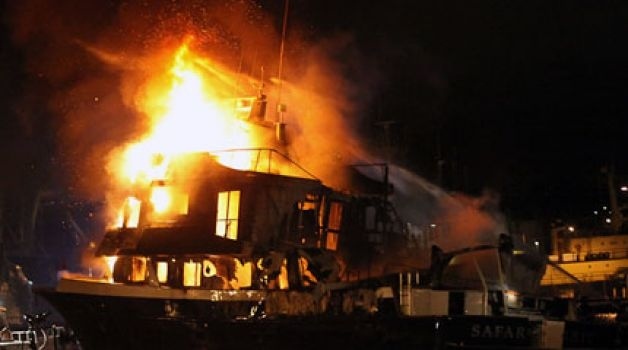 A spectacular fire destroyed a 105-foot yacht at the Seattle Fishermen’s Terminal on Friday, just hours before it was due to depart on a 15-day Alaskan cruise. The harbour patrol boat managed to tow a half-dozen other boats away from the area to protect them from the fire. The fire call came in at 1:10 a.m., and crews fought the fire with two hoses from shore — each pumping 300 gallons a minute, and a fire boat — pumping 800 gallons a minute. 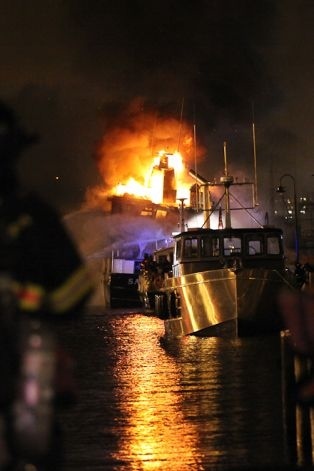 The harbour patrol boat also used fire-suppressing foam in an attempt to extinguish the flames. “It just couldn’t get that fire knocked down,” said Fire department spokesman Kyle Moore, estimating that flames continued to engulf the yacht until about 5 a.m. It continues to burn this morning and likely will do so for several hours. The boat’s owner and its engineer were asleep when they heard a popping sound, the fire restricted the exit’s on the boat so the two shimmed down a mooring line to safety. A 45-foot response boat from Coast Guard Station Seattle is enforcing a 200-yard safety zone around the terminal and assisted in deploying containment and absorbent boom in the area to mitigate impact to the environment. The boat is the Safari Spirit, part of Seattle-based American Safari Cruises, which operates four yachts on Alaska cruises. According to the American Safari Cruises website, the Safari Spirit was scheduled to leave Friday on a 15-day Alaska cruise from Seattle to Juneau and back.